Well, I was in a mood to create something cutesy! 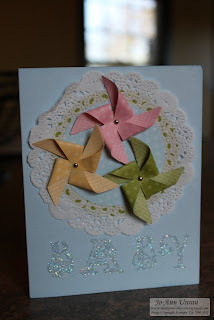 I am running low on baby cards in my Card Box, so it was time to come up with a few. 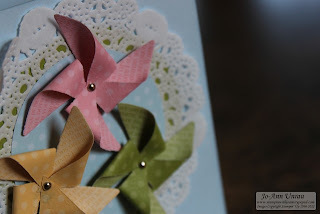 I used the new Pinwheel Sizzlet to cut these out really quickly. The colors are Bashful Blue, Pretty in Pink, So Saffron and Old Olive. 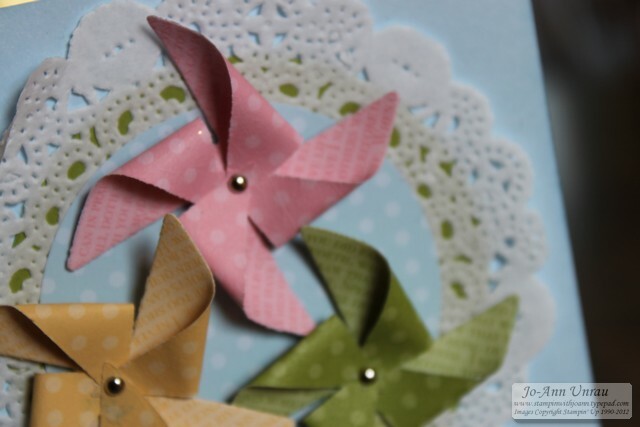 I find it easiest when using the Pinwheel Sizzlet to NOT use the little holes that are there. I just use Snail Adhesive to glue every second corner into the centre, overlapping them as I go. Then, make a hole using the Paper Piercer and Foam Pad, and put a brad through the centre. Hope you like my Baby card today! 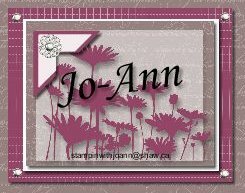 Place an order with me during the month of May, and receive a NEW 2013-2014 Stampin' Up Annual Catalogue for FREE! Check out all my Clubs!